over to the left-hand seat after a mission on June 27, 1944. 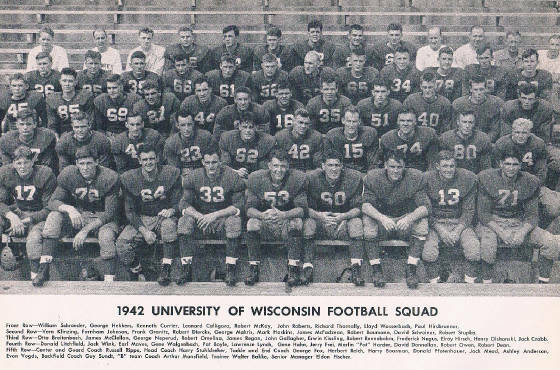 Several Badgers who fought in the Battle of the Bulge. This is adapted material from Third Down and a War to Go. message said he had been missing since June 27.
were known as the “Touchdown Twins” after they made good as sophomores. the ground, wound up in the notorious Stalag Luft III, the “Great Escape” camp. was as high as fifteen. and Harry, and Harry was the one used for the flight. continued their attempts to construct an escape tunnel of their own. equipment, or men. The odds were too great, the result inevitable. A corporal raised a white flag. destroy my hunting knife, and the damn Jerries got it,” Pfotenhauer wrote. The Germans forced the Americans to march out. and if approved, he would be given maps, money, and wire cutters. he was instrumental in the Americans’ largely surreptitious organization. at Stalag Luft III, never a picnic, was getting even tougher. where prisoners could gather, put on shows, or stage other activities to pass the time. four hundred seats from Red Cross boxes. British-led escape attempt—and the retribution. One tricky part of the process was getting rid of sand and dirt from the tunnels. loose soil exposed so they could mix in dirt from the tunnel. preserve their own sense of collective defiance and hope. For Hoskins, day-to-day life in camp was a fight against boredom and malnutrition. where they bartered mainly for clothes, food, cigarettes, and reading material. parcel. Slowly the men would accumulate enough parts. scripts from anthologies. Participants dressed in women’s clothes for the female roles. Stalag Luft III and said the prisoners had to be ready to march out momentarily. Russian forces under Marshall G. K. Zhukov were only about twenty miles away. had to be left behind to freeze to death. day, and we traveled a good ways until we came to a town called Moskau. German town that served as headquarters for a German tank unit. The prisoners were gathered in a square and encircled by tanks. loaded onto trains. The cars were packed, and the stench was choking. wouldn’t attack us. And they didn’t. “There were a certain number of guards on the train, not one per car. VII-A. Stalag VII-A made Stalag Luft III seem like the Waldorf-Astoria. Germans violated rules of war by staging mass executions. One day, Hoskins sat on the steps outside his ramshackle barracks. a time the German gruel was the prisoners’ only sustenance. trucks leaving the camp. In the morning, most of the guards were gone. Hoskins and Dave Schreiner as pledges. inside to look for him before reluctantly deciding it would be a long shot. Ten months after his mission to Budapest, Hoskins was liberated. day after that, General George S. Patton Jr. visited the Americans at Stalag VII-A. miles away. “It took about three or days for the planes to come and get us,” he said. that if you put the skis between two abutments, that would give you a place to sleep. The war was over in Europe. remainder could remain behind for likely liberation by the advancing U.S. The healthiest felt it was their duty to volunteer, so Pfotenhauer did. uncertainty, Pfotenhauer read Bible psalms the night before leaving. and the other Americans were free. “We were so happy, we cried,” he wrote. ammo, and was just waiting for one of them to make a break,” he wrote. but still she was shocked when she saw how thin he truly was. while serving with an infantry regiment with Patton’s Third Army. decided not to tell him about his brother’s death in a letter. One of the first stops he made was to visit Dave Schreiner’s parents.